Nice picture !! I love it !!! Like this story a lots !!! Wish to sleepon his tummy too !!! Thank for sharing !! I love My Neighbor Totoro!! I also want to sleep on Totoro! That looks so much fun and i love sleeping. *yawn* And sleeping at tree. Me too! Aaaahhhwwww - thats so sweeeeet! me looooves Totoro! thanks for the sweet scan! he's too cute! Since I know Totoro doesn't exist, I want to get a HUGE stuffed animal that's modeled after him so I can sleep on him (I think this is a great idea) =O I WANTED ONE EVER SINCE I WATCHED THIS MOVIE! Wierd animation. But at least it is a peaceful movie. 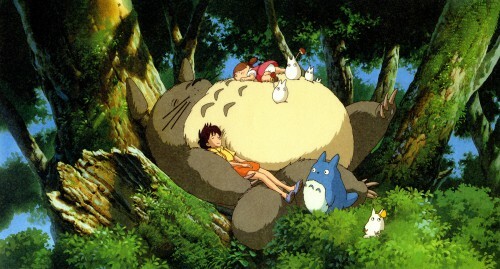 I wish I could sleep with Totoro! DX I do have the next best thing though: two giant dogs (an Irish Setter and a Great Dane) who really love to cuddle. ^_^ Thanks for sharing! This is a great scan! Calms my heart..Thanks for sharing! How i wish I can sleep on Totoro's belly! Looks really warm! love pic love totoro ?